You could be forgiven if John Quenneville’s name isn’t immediately recognizable. First, his name recalls his second cousin, Chicago Blackhawks coach Joel, and sometimes he may be mistaken for his older brother Peter (also with Brandon) or his younger brother David (a Medicine Hat prospect). Second, his game is very substance over style. That’s not to say that he’s not flashy, just that he’s not overly showy; he’s just a quietly efficient player. He produced at just under a point-per-game during the season, and outside of a four-game stretch in October and a few multi-point games here and there, he was a steadily consistent producer all season long. And on a team with only a few “plus” players, he had a plus/minus in the black. Quenneville plays a generally responsible three-zone game, but needs a bit more discipline at times. He plays physical and is willing to scrap – he had 5 fights in 2013-14 – but sometimes needs to rein in the aggression before it gets out of hand. He was second on the Wheat Kings in penalty minutes. When he can tie it all together, though, Quenneville can be a good player verging on great. 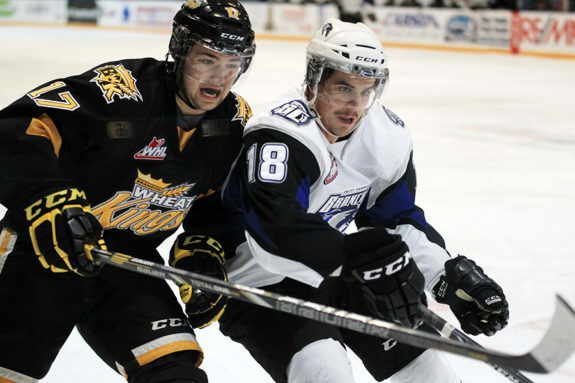 He led the Wheat Kings in playoff scoring and was easily their best player through two playoff rounds, utilizing his size, speed, instincts and superior hockey sense. The big question for his development is whether that great stretch is “just nine games,” or indicative of how he can play all the time. Quenneville represented Team Pacific at the World U-17 Hockey Challenge – winning silver – and Team Canada at the U-18 World Championships – winning bronze. Third or fourth line player with upside. Relied too much on extra time and space of power-play to produce offense. A good comparable for Quenneville is someone like Nick Bonino or Craig Smith. Quenneville could go anywhere in the second or third rounds.